[SINGAPORE] The tight labour market in Singapore has resulted in more jobs and higher salaries for locals, while the growth in foreign worker employment fell to its slowest quarterly pace since 2009. 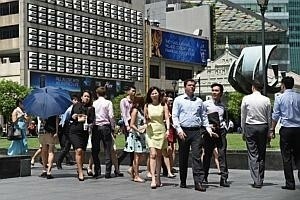 Last year, the real median gross monthly income for full-time citizen workers went up by 4.6 per cent, the ministry said as it released details of Singapore's labour market situation for the first half of 2014. The latest numbers are indicative of the government's ongoing push to progressively raise the quality of the foreign workforce and reduce the reliance on foreign labour. This, said MOM, is in line with national efforts to achieve quality economic growth driven by sustained productivity improvements. In a statement, the ministry said that it expects the strong hiring of Singaporean workers to continue for the rest of this year. This is due to a confluence of foreign workforce constraints, higher wages, and employers adopting flexible work arrangements to attract more women and older workers into the labour force. MOM added that wages are expected to continue moving up, but these increases could only be sustained over the long term by improving productivity. As for foreign workers, MOM said that their total employment growth slowed to 11,200 for the first six months of 2014, which was less than half compared to the same period in 2013. What's also notable is the fact that foreign employment growth in the second quarter of 2014 came in at just 3,800. This is the lowest quarterly expansion since the third quarter of 2009 during the global financial crisis, when only 700 foreign worker jobs were created. OCBC economist Selena Ling said that foreign employment growth was at a low as firms continue to adjust to manpower policy constraints, although the transition process for selected labour-intensive services and construction sectors was "probably more accentuated". "The consolidation process for firms will likely continue in the interim as the productivity performance of these few sectors are still falling short of targets," she said. "Overall productivity growth is expected to remain uneven," said MOM in its outlook for the rest of the year. Michael Smith, the country director in Singapore for employment services provider Randstad, said that, in order to maintain productivity, employers should continue to offer workforce-relevant upskilling and career growth opportunities to help fill the gaps for skills that are in demand. "As the economy restructures, some consolidation and exit of less-productive businesses are expected. MOM and the Workforce Development Agency stand ready to help displaced local workers re-skill and upgrade so that they are positioned to take on the new jobs created."